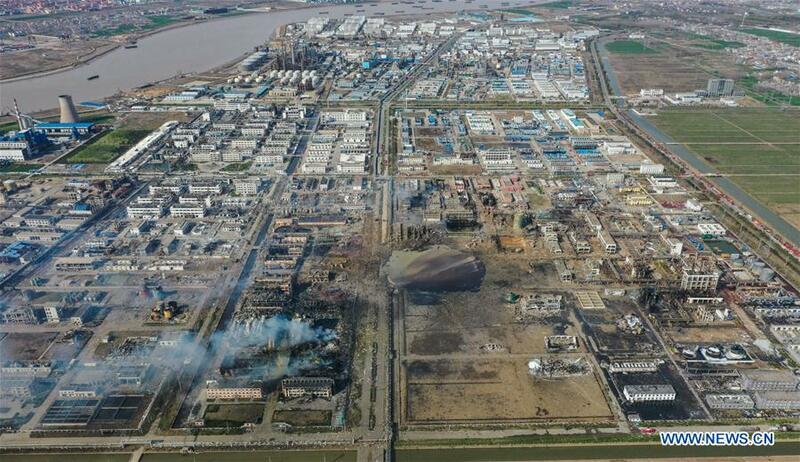 The death toll from an explosion in a chemical plant in east China's Jiangsu Province has risen to 64 as of 7 a.m. Saturday, authorities said. One person was rescued alive on Saturday morning thanks to an around-the-clock search, about one and a half days after the devastating blast. But 28 people are still unaccounted for, Cao Lubao, mayor of the city of Yancheng, said at a press conference. Among the dead, 26 people have been identified, and their next of kin have been notified and offered with comfort and assistance, Cao said. The mayor added that the people reported as missing could possibly be among the 38 victims whose identifications have yet been verified. The blast also left 94 people with severe injuries, including 21 in critical conditions. Thousands of firefighters and medical workers and hundreds of ambulances and fire trucks have joined an all-out rescue after the explosion. Sixteen hospitals in Yancheng have accepted 617 injured people so far, 523 of which have minor injuries. According to local authorities, all readings by the environmental monitoring system were within a normal range, and drinking water was not affected by the blast. Dams were built to prevent polluted water from the chemical plant from flowing into the rivers. A total of 89 houses in nearby areas were severely damaged in the blast. The households will be compensated or relocated, authorities said. The damaged doors and windows at 10 nearby schools will be fixed in time to ensure classes resume as normal on Monday.